In some cancers, such as those of the colon, some of the surrounding tissue can be removed as well as the tumour. Removing a brain tumour needs to be more precise. Dr Colin Watts, who is leading the trial at the University of Cambridge, told the BBC that surgeons "don't want to take too much functional tissue away". The trial will then test whether applying drugs directly to the tumour improves survival rates. 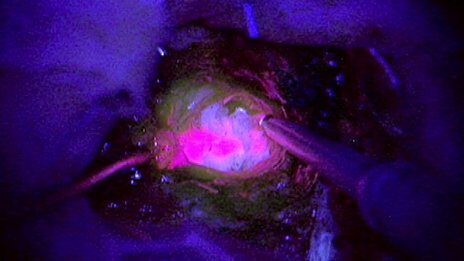 After the tumour has been removed under UV light, a thin drug-soaked wafer will be placed in the space left behind. This should slowly release chemotherapy drugs over four to six weeks to kill any remaining cancerous cells. This could overcome one of the challenges with chemotherapy for brain tumours. Dr Watts said: "One of the problems with chemotherapy is we don't actually know the extent a drug penetrates a tumour because of the blood brain barrier." By applying the drug directly to the tumour it should be at a higher dose. Charles Meacock, 56, from Norfolk, who has already taken part in the trial, said: "Hopefully it will benefit me, but will also help people in my situation in the future. "It's four weeks since my surgery and my recovery seems to be going as it should. I just have to wait and see now." The study has been funded by the Samantha Dickson Brain Tumour Trust and Cancer Research UK. The founder of the Samantha Dickson Brain Tumour Trust, Neil Dickson, said he was proud to be funding the trial. "Brain tumour research receives a fraction of the funding of that of higher profile cancers and it is our priority to redress the balance," he added. Kate Law, Cancer Research UK's director of clinical research, said: "Treating brain tumours is a real challenge facing clinicians and we urgently need new treatments to help more people diagnosed with the disease." Trials involving more patients will take place if this one is successful.